Climate change is a high profile political issue in Europe. Scientific evidence and explanations of climate change have accumulated over several decades. The coordinated work of the Intergovernmental Panel on Climate Change (IPCC) and the first obvious signs of climate change moved the topic into general public debate and onto the political agenda. In the Europe 2020 Strategy for smart, sustainable and inclusive growth, the EU has set five headline targets, which are to be reached by 2020. One of the targets is related to climate change and energy. More specifically, greenhouse gas emissions should be reduced to a level which is 20% or possibly 30% lower than in 1990, 20% of energy should constitute of renewable energy and energy efficiency should be increased by 20%. In the Territorial Agenda 2020, questions relating to climate change and environmental risks are also regarded as important and they are seen to pose both challenges and potentials for territorial development. 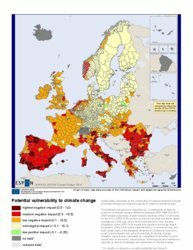 Impacts of climate change vary considerably across Europe with different degrees of vulnerability. Regions have different opportunities to embed adaption and mitigation into their strategies in order to adjust their socio-economic systems to a low carbon economy. Climate change can also lead to new development opportunities, for instance within agriculture, green economy and renewable energy production. In 2009 the EU White Paper “Adapting to climate change: Towards a European framework for action” explicitly related climate change to territorial development in Europe and called for a planned response. This requires an appropriate evidence base. Many studies have until now focused on different types of impacts of climate change in Europe. The focus has mostly been on very specific impacts, which contributed to the overall understanding of climate change, but findings have seldom been transferable or comparable between sectors or between regions. 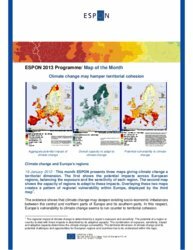 With the ESPON Climate project the ESPON programme conducted an innovative, integrated and pan-European climate change vulnerability assessment with a clear territorial dimension. The results of this project will enable policy-makers to understand the diversity of climate change impacts and develop territorially differentiated adaptation strategies at the European, national and regional level. 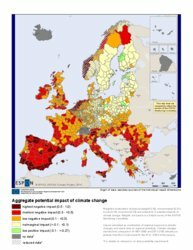 The potential impacts of climate change vary considerably across Europe: Particularly negatively affected regions are primarily found in the South of Europe – e.g. the big agglomerations and the summer tourist resorts along the coasts. 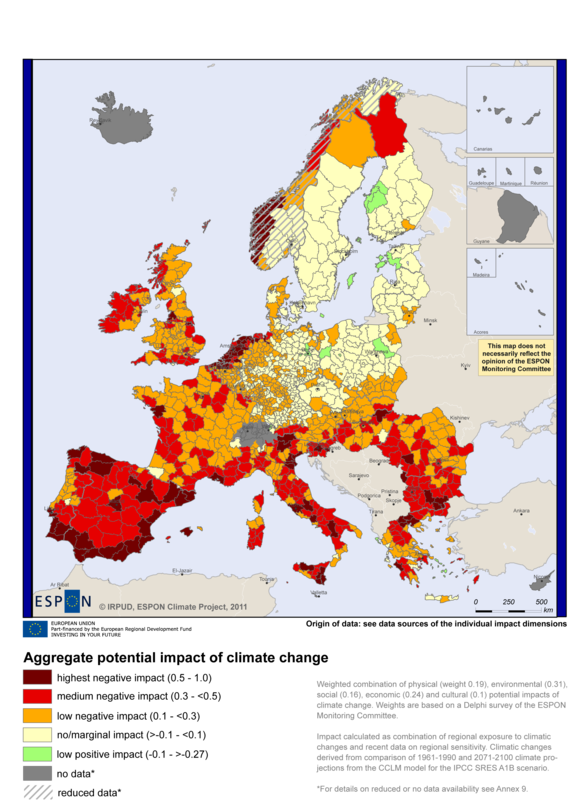 Many mountain areas and coasts in other parts of Europe are also highly impacted, but for other reasons such as coastal storm surges, economic dependency on winter and/or summer tourism. Many central, eastern and northern European regions face virtually no negative impacts or are even witnessing positive potential impacts of climate change. 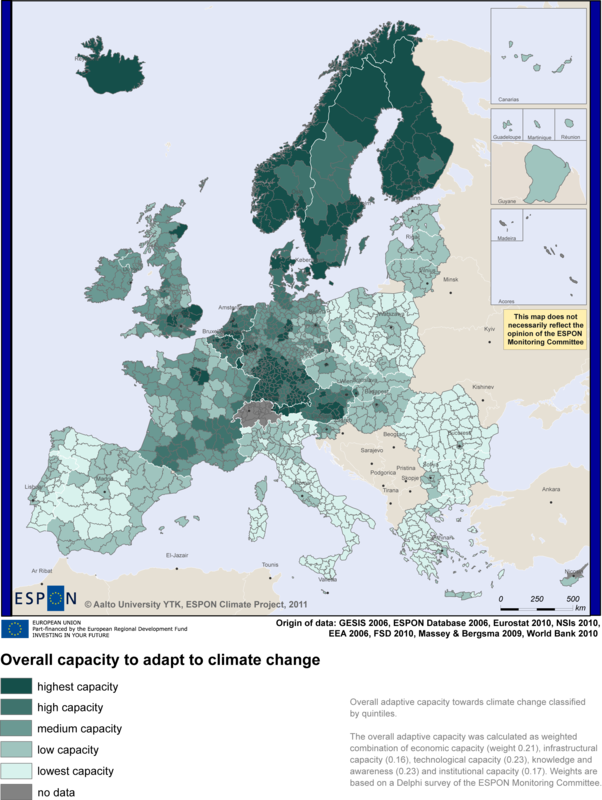 The adaptive capacity of Europe’s regions shows a similar, yet inverted pattern. 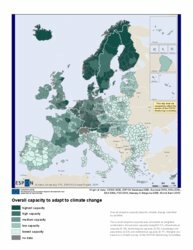 Northern and central European regions have a higher capacity to adapt to climate change than regions in eastern and southern European countries. Generally, though, regions with concentrations of population, economic and research activities have higher adaptive capacities than more rural regions. The map showing the potential vulnerability to climate change in Europe seems to mirror the territorial pattern of potential impacts, but with an even more pronounced South-North imbalance. This is due to the high adaptive capacity in Scandinavian and Western European regions, which compensates for the potential impacts projected for these regions. However, in the Mediterranean region and in South-East Europe, where medium to high negative impacts are to be expected, the ability to adapt to climate change is generally lower thus resulting in medium to high levels of vulnerability. The comprehensive and pan-European climate change vulnerability assess¬ment has provided not only regionally specific results but also general pointers for a climate change responsive European policy including a territorial dimension. Most importantly, Europe’s climate change vulnerability seems to run counter to territorial cohesion. 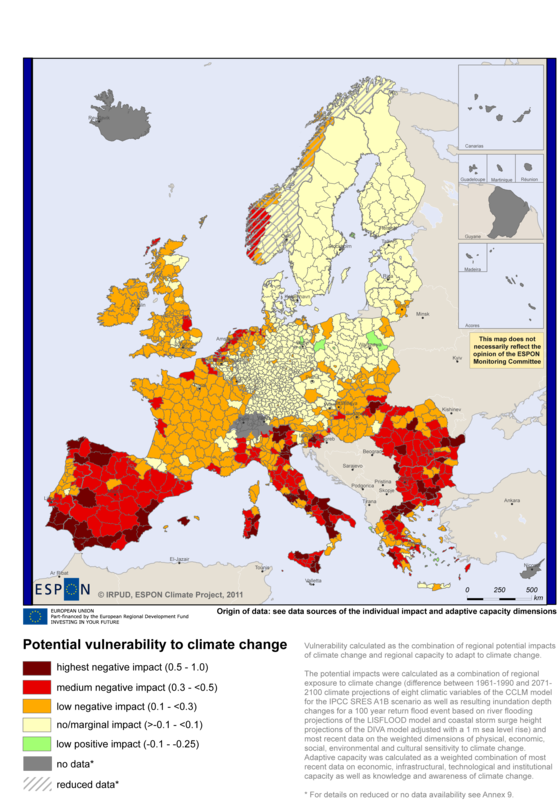 The assessment indicates that climate change would deepen the existing socio-economic imbalances between the core of Europe and its southern and southeastern parts because many economically lagging regions are also the most vulnerable for climate change. 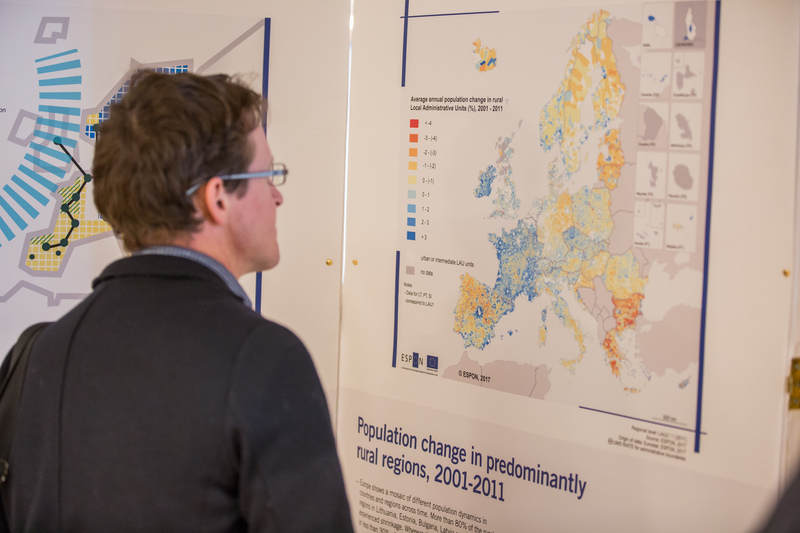 Eastern Europe is already and will continue to be affected by severe demographic changes (in particular outmigration and ageing), which may further increase these regions’ climate change sensitivity and impact and decrease their adaptive capacity. For example, an older regional population is more sensitive e.g. to heat and less capable to adapt to climate change. The territorial patterns of vulnerability call for continued efforts by policy makers, ensuring effective coordination of different policies, actors and planning mechanisms and call for a more strategic approach to enhance territorial cohesion. Territorially differentiated adaptation strategies seem to be important, especially for regions in the Mediterranean region and in South-East Europe. The most vulnerable types of regions are: (1) Coastal regions with high population concentrations and high dependency on summer tourism, (2) mountain regions with high dependence on winter and summer tourism, and (3) agglomerations with high population density, where the problem of urban heat might become most relevant. New economic development opportunities are likely to emerge for European regions through adaption and mitigation to climate change. More focus should be given to the options in different territories for capitalising on the changed climatic conditions. Given the regional diversity regarding expected climate change impacts, it is the challenge for regional and local actors to identify and harvest such opportunities. For the assessment the ESPON Climate project built on a conceptual framework that is widely used in the climate change and impact research community. According to this framework, rising anthropogenic greenhouse gas emissions contribute to global warming and thus to climate change. But the potential impacts of these changes may differ greatly between regions. Not only are some regions more exposed than others, but the specific configurations of climatic changes also vary significantly. In addition, each region already has distinct environmental, social and economic characteristics and is therefore more or less sensitive to climate change. Thus, only exposure and sensitivity together determine the possible impact that climate change may have on a region. In addition, the potential of a region or country to deal with these impacts is described by its adaptive capacity. Finally, the combination of these four factors, exposure, sensitivity, impact and adaptive capacity, determines the climate change vulnerability. For the exposure analysis the relevant climatic changes were derived from a comparison of 1961-1990 and 2071-2100 climate projections from the CCLM(1) climate model using the IPCC emissions scenario A1B(2). Eight climate variables were calculated, supplemented by one indicator each on the immediate ‘triggered effects’ of river flooding and coastal storm surge flooding. For determining impacts these exposure indicators were carefully related to 19 sensitivity indicators. For example, heat sensitive population (persons older than 65 years living in densely built up areas of cities) were related to changes in the number of summer days (above 25°C), while forests sensitive to fire were related to changes in summer days and summer precipitation. The resulting individual impact indicators were then aggregated to determine the physical, environmental, economic, social and cultural impacts of climate change. The overall impact was calculated using different weights for these impact dimensions, ranging from 0.1 for cultural impact to 0.31 for environmental impacts. 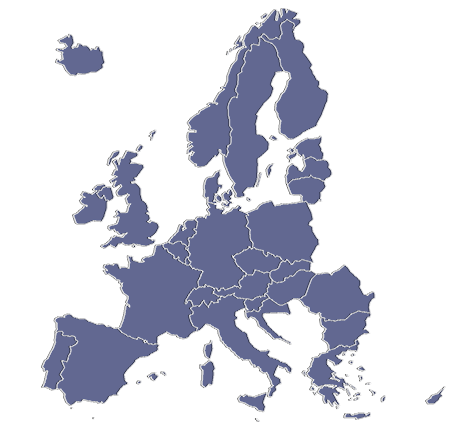 These weights were based on a Delphi survey of the ESPON Monitoring Committee members, which represent the European Commission, 27 European countries and four Partner States. The adaptive capacity in regard to climate change takes into account the economic, socio-cultural, institutional and technological ability of a region to adapt to the impacts of a changing regional climate. This could mean preventing or moderating potential damages, but also taking advantage of new opportunities opened up by climatic changes. A total of 15 indicators were developed and then aggregated to reflect on the five adaptation dimensions of knowledge and awareness, technology, infrastructure, institutions and economic resources. The overall adaptive capacity was again determined by weighting and then combining these dimensions on the basis of the Delphi survey mentioned above. Finally, in order to determine the overall vulnerability of regions to climate change the impacts and the adaptive capacity to climate change were combined for each region. The underlying rationale is that a region with a high climate change impact may only be moderately vulnerable if it is well adapted to the anticipated climatic changes. On the other hand, high impacts would result in high vulnerability to climate change if a region also has a low adaptive capacity. Any climate change vulnerability assessment is of course confronted with uncertainty – due to the used climate model, the chosen emissions scenario and the largely uncertain socio-economic development trends (which could only partly be captured in the project). Thus, the results of the ESPON Climate project have to be seen as a vulnerability scenario, which shows what Europe’s future in the wake of climate change may (based on current knowledge) look like, and not as a clear-cut forecast. (1) CCLM is a non-hydrostatic unified weather forecast and regional climate model developed by the COnsortium for SMall scale MOdelling (COSMO) and the Climate Limited-area Modelling Community (CLM). (2) The IPCC developed six scenarios on the development of greenhouse gas emissions from 2000 to 2100. A1B is used for almost all vulnerability assessments as a moderate scenario. Map "Aggregate potential impact of climate change"
Map "Overall capacity to adapt to climate change"
Map "Potential vulnerability to climate change"
A better understanding of FDI inflows and their effects on cities and regions helps to embrace the benefits of globalisation and prevents potentially negative effects. More than ever, cities today need to reinforce smart, sustainable and inclusive growth, while managing e.g. demographic change, housing, urban mobility, energy transition, all in a context of scarce public but also private resources. They function as nodes of development and contribute decisively to local, regional, national and European economic growth.